Magic is authentic skiing, interesting trails, few skiers, a warm welcoming bunch of locals, even lively après ski bar at the homey base lodge. No fancy quads or high speed laps here, but you do get ski trails all to yourself. Magic’s moniker is Steeped in Tradition, and a dozen of the 43 trails are steep indeed, like Magician’s top pitch at 45-degrees. With 1,700’ vertical, there’s earthy glades like Disappearing Act, and gritty drops like Slide of Hans. But families will also find gorgeous groomed cord on Show Off, Hocus Pocus, Talisman and Sorcerer (kids love the magic theme). Magic opened in 1960, and its rustic base lodge and 1970 vintage “Red” double chair to the 2,850’ summit are testament to classic old-fashion New England skiing. Your kids won’t disappear at Magic, everyone knows each other here. You can watch them tube in the Alacazaam Park while you enjoy après ski with live music at the upper floor Black Line Tavern – BLT to the Magic regulars. Magic is independent, and so is their limited schedule of lift operation Thursday – Sunday, with the exception that they will open midweek for “Powder Days” if they get 6 inches or more by 8am. Love that adaptation. Throwback Thursdays at Magic are just $20, unless it snows 6-inches – as previously stated – then Powder Day $63 rates apply. The Magic spell over the past 57 years has been up and down for this ski area, founded in 1960 by Swiss ski instructor Hans Thoren, who dubbed this a “Little Corner of Switzerland.” In 1996 a group of investors bought the ski area that had been closed for five years following Bromley’s ownership. In 2012, Magic sold shares to loyal skiers to invest in the mountain, much like Mad River Glen. in 2016, Magic sold to a few owners. 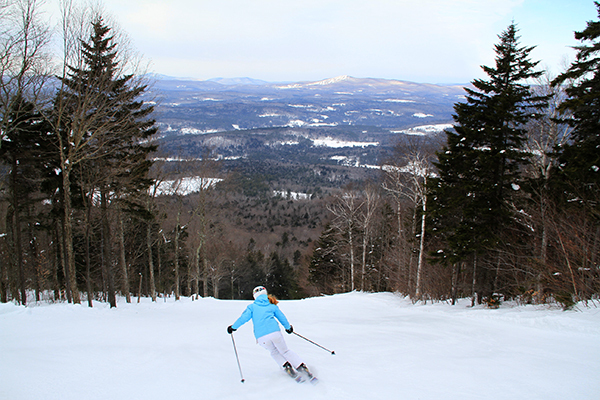 From the slopes of Magic, the sweeping Vermont views are magical, you can see Bromley’s south face and Stratton in the distant. Located in the pretty town of Londonderry, you are in true Vermont ski country – plenty of inns, but the only slope-side lodge, besides condos, is the Upper Pass Lodge – a comfy lodge with affordable rooms and a casual Vermont-sourced Red Slate Restaurant and fireside bar downstairs. My parent ran a ski lodge in the 80s at Smugglers Notch and this was a friendly flashback for me. Upper Pass Lodge encourages families to pile in with their kids and pets, relax by the fire with drinks, play games and let the kids be kids. Magic will cast a spell on you if you seek old-school terrain and the un-adorned alpine tradition. This is a great independent Vermont ski area near the more resort like skiing of Bromley and Stratton. Magic has two chairs, the Red chair- also called the “No Wind Holds” is a 1970-vintage double to the 2,850’ summit, and the Black Chair – a triple running parallel from the base but landing just 100’ shy of the top at 1,600’vertical. Magic Mountain has a boundary to boundary ski policy and a generous Woods and Unmarked Skiing and Riding Policy, including Uphill Skiing access. TimberQuest is Magic’s adventure Tree-versing park with ziplining and obstacle course fun in summer.